Spring is from September to October. Depending on weather conditions, seasons and flowering times may be earlier or later than mentioned here. Much of our richly diverse flora are flowering at this time, including proteas and ericas for which the Cape is renowned, as well as a host of other lesser known species. Many of these are in the daisy family. 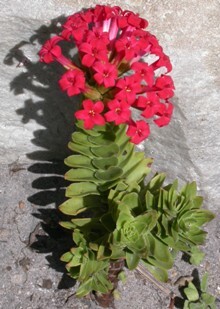 There are also geophytes and some interesting endemics, making it an ideal period for flower shows. Bring a warm jersey and waterproofs – you may need them. 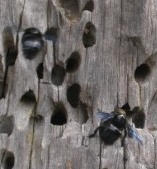 With the warming weather the carpenter bees, which live in the thick pole at the corner of the entrance building, become active and may be seen busily collecting pollen from all the flowers belonging to the pea family, such as the water blossom pea with its large mauve and white flowers. The tiny, superbly coloured Orange Breasted Sunbirds, a fynbos endemic, with their amazingly loud and noisy call, chase one another around the flowering bushes. 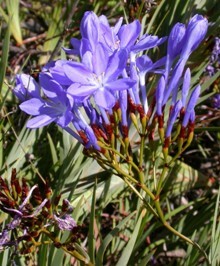 Many of the bulbous plants such as the dainty yellow ixia, pink oxalis and the blue geissorhiza which come up in their hundreds on the lawns, are favourites of the foraging baboons which visit the garden. Tall yellow spires of golden sceptre, Wachendorfia thyrsiflora, flower spectacularly along the streams and blend together with a number of other lovely wetland species which can be enjoyed up close from the wetland boardwalk. Betty’s Bay, with its land-based Penguin colony, is on the Whale Route, so not only will you enjoy the many floral gems of the area but you may also be lucky enough to see whales out in the bay from our upper walking trails. November can still be quite cool, while the hottest month is usually February. Days are long and mostly sunny. The two beautiful gorges (kloofs) with their amber coloured streams and pools provide cool dappled shade and protection from the south east wind which often blows at this time of year. From the last week of December to the last week of January the magnificent red disa, Disa uniflora, can be seen growing on the damp cliffs near the waterfalls. 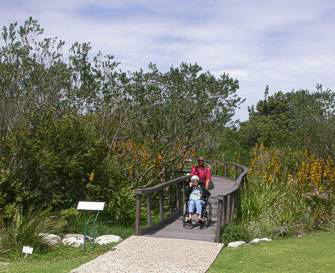 Disa Kloof is the only place in the world where people in wheelchairs may enjoy the sight of this magnificent orchid growing in its natural habitat. Bring your binoculars to really appreciate their delicate beauty and to study the many birds in the Garden. Our national flower, the king protea, Protea cynaroides, is very much in evidence as are the magnificent blue spikes of the common aristea, Aristea capitata.In mid-summer the sweetly scented pink bells of the malagash lily, Ammocharis longifolia, together with the deep blue of the blue lily, Agapanthus africanus, and the bright red of the red crassula, Crassula coccinea, make bright splashes of colour in the Garden. The star turn in late summer is the superb and unusual woody, blue flowering member of the Iris family, Nivenia stokoei. The huge, spectacular deep red tumble-weed heads of the candelabra lily, Brunsvigia orientalis, and the bright sealing-wax red heads of the April fool, Haemanthus coccineus, are also a must see. Summer time is the time when many birds are breeding, including the summer migrants such as the lovely Paradise Flycatchers. Their long orange tails give away the site of their dainty, well-camouflaged nests amongst the forest trees where they build. The snakes are also active at this time, and the hungry Boomslang in particular terrorizes the anxious parent Cape White Eyes and many other birds who do their best to protect their eggs and nestlings from this streamlined marauder. Puffadders and bergadders are quite often seen and care must be taken not to step on these lazy and highly toxic reptiles when walking the trails. Strikingly coloured dragonflies and damselflies zoom to and fro above the streams and ponds, adding to the vibrant life in the Garden. Tortoises are active at this time of year and can be seen trundling about most days. This is also the time when the Garden organises outdoor concerts during the festive season school holidays. Between April and May, days are often crisp and sunny, ideal for walking. Do however bring something warm and weatherproof as you may get all four seasons in one day! The scarlet Guernsey lily, Nerine sarniensis, dusted with gold, can be found in the Dell near the round bridge. 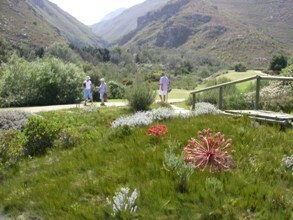 Then you might go on to the Fynbos Trail where many of the tufted, grass-like, wind-pollinated restios are at their best. 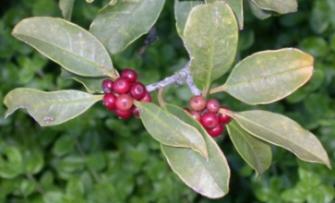 In the wooded gorges the Cape holly, Ilex mitis, is in fruit. Its bright red berries provide a feast for fruit-eating birds such as the Speckled Pigeon, the Cape Bulbul and flocks of endearing and comical Speckled Mousebirds. The purple fruits of the Cape beech, Rapanea melanophloeos, and the cream ones of the assegai, Curtisia dentata, also begin to ripen, making this a season of plenty for many animals and birds. Out in the open the Bot River protea, Protea compacta, lifts pink heads on long stems and is usually the earliest of the proteas to flower. 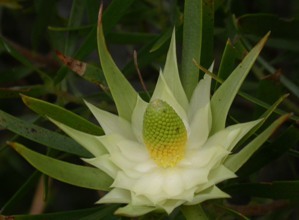 It is followed by the bearded narrow-leaf sugarbush, Protea neriifolia, in shades of pink and the wagon tree, Protea nitida, with its white shaving brush flower heads at the ends of the grey-leaved branches. An enticing spread of Erica species such as small tassel heath, E. coccinea, brown tongue heath, E. plukenetii, and the bountiful bushes of E. ericoidesare displayed across the flats and hillsides. 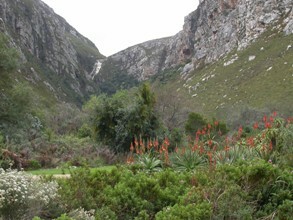 This season (June – August) is known as the ‘Green Season’ in the Cape with its winter rainfall. Be prepared for rain and cold, but the odd sunny days are glorious! Streams and rivers are flowing strongly and after heavy rains the waterfalls in both gorges are spectacular. Ditches and watercourses are often clothed with swathes of arum lilies which are the favourite food of the nocturnal porcupine. The arums provide a convenient hunting ground for the little arum lily reed frog. Its insect prey is attracted to the copious quantities of nectar and pollen shed by the yellow spike of flowers at the centre of the white, cup-like spathe. This is also the time when the hillsides are dotted with the yellows and ivories of the conebushes and the pinks, reds and oranges of pincushions, proteas and pagodas, all belonging to the Protea family. Wherever there are proteas flowering you will also find the Sugarbird, which is endemic to the fynbos, the males putting their long tail feathers on display to attract the ladies. Kumara disticha, previously known as Aloe plicatilis, with its fan of grey-green leaves puts up its sturdy orange flower spikes. Our local fynbos aloe, Aloe succotrina, and the krantz aloe, Aloe arborescens, also make a show providing the malachite and southern double-collared sunbirds with nutrient-rich nectar. 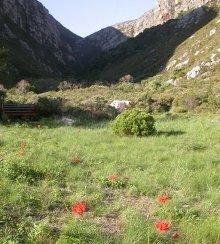 A visit at any time of the year will be well-rewarded with an array of fauna and flora which all play a role in this fabulous veld type called fynbos. Come and see for yourself!